As nervous as I may be about my innocent little not-quite-six year old spending her school days in the company of children ranging in ages from 6-10, we also love the the Montessori mixed-age experience. This year will be a big year for her – I can’t wait to see how she’ll grow and what she’ll learn, not just from her teachers, but also from the other children. By the way, this picture is a good image of one of the things we love about Montessori – no homework! Most days, Nora will only need to take a lunch box to school and no backpack because she will not be bringing homework home. Wondering about the shoes? In Montessori classrooms, children change out of their street shoes into indoor shoes when they arrive. 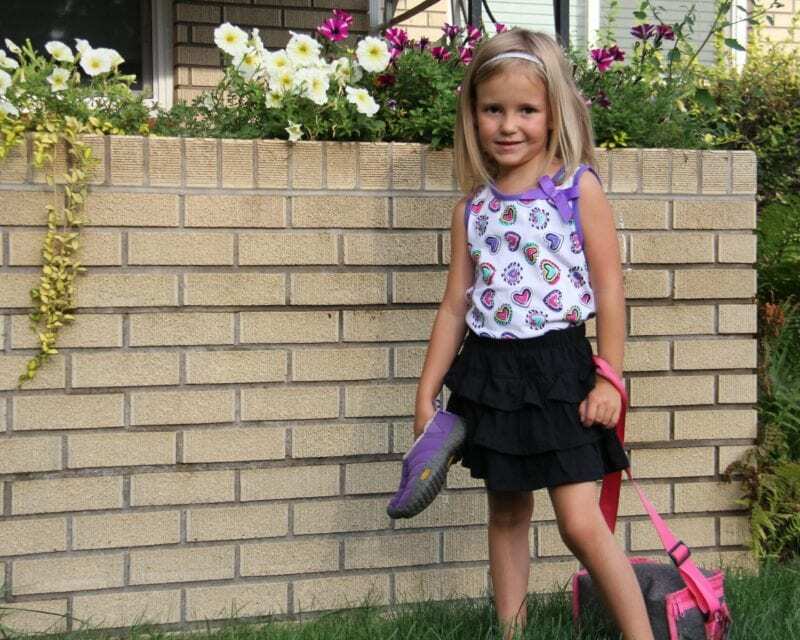 She’ll leave those shoes at school to wear all year while in the classroom. Such a lovely girl. Good luck with the first grade experience. It’s a milestone.